Trailed by a client, a friend from L.A. (where Luntz now lives), and two aides, Luntz makes his way into the school’s gymnasium, arriving as a Rick Perry backer is giving an impassioned plea on his candidate’s behalf. The Perry guy turns to Luntz and asks him to address the rest of the voters. 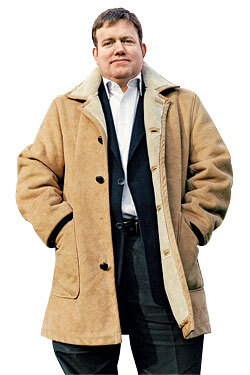 Luntz steps in front of the bleachers and struggles to button his coat over his paunch. “They say television adds ten pounds? For me it’s twenty!” His audience bursts into laughter, but then Luntz turns serious. “You’re real people getting up and speaking out and defending their principles,” he says. “Just remember one thing: Treat each other with respect, civility, and decency. There’s too much yelling in politics now.” For someone who makes a living as the progenitor of ruthlessly effective talking points that have sharpened the partisan conflict in Washington (“death tax” and “climate change” are two of his coinages), Luntz approaches the grassroots process with disarming earnestness. He pairs a navy suit, apparently unironically, with custom K-Swiss sneakers dyed like an American flag. It’s after eleven by the time we drop in on the Mitt Romney party at the Hotel Fort Des Moines. Luntz is staying here, but he has to make one more stop at Fox’s field headquarters to tape a segment for Fox & Friends. That wraps at close to 1 a.m., and we’re back in the SUV rolling through deserted streets, with Luntz staffer Ben Clarke at the wheel. “I’m hungry,” Luntz announces. He directs Clarke to the Marriott. All the parking spots are taken. Luntz points at a no-parking zone. “Get some sack,” he tells Clarke. “Get some sack?” asks his aide Alyssa Salvo from the back seat. “I’m impressed with the way that just rolled off your tongue,” Clarke says. The Marriott bar, unsurprisingly, is still thronged with reporters. Luntz beelines for the lobby souvenir shop and buys a box of vanilla Nestlé Dibs. Iowa congressman Steve King spots him and comes over to trade political gossip. Luntz tosses ice-cream candies into his mouth as they talk. The circus is moving on to New Hampshire tomorrow, and Luntz has to be up at 6 a.m. for interviews with The Economist and NPR. But that’s not for another four hours. “Why are we done?” he asks, as we finally pull up to his hotel.